Born between March 21st and April 19th and known to be Energetic, Enthusiastic and Confident. They’re the first sign to have emerged out of the uncertain skies, and this trail-blazing nature shines through in Aries in the present. They’re the ones who’ll always run off to pursue the next big thing, put all of their energy into an exciting new project or try and conquer the heart of someone they’ve set their sights on. Like the ram which represents her, an Aries charges into the unknown and uncertain, taking care not to leave behind the people she cares for the most. An Aries is the kind of leader people are glad to follow because they know she won’t back down. Giving her all inspires others to follow in the same way, and makes them better people for it. 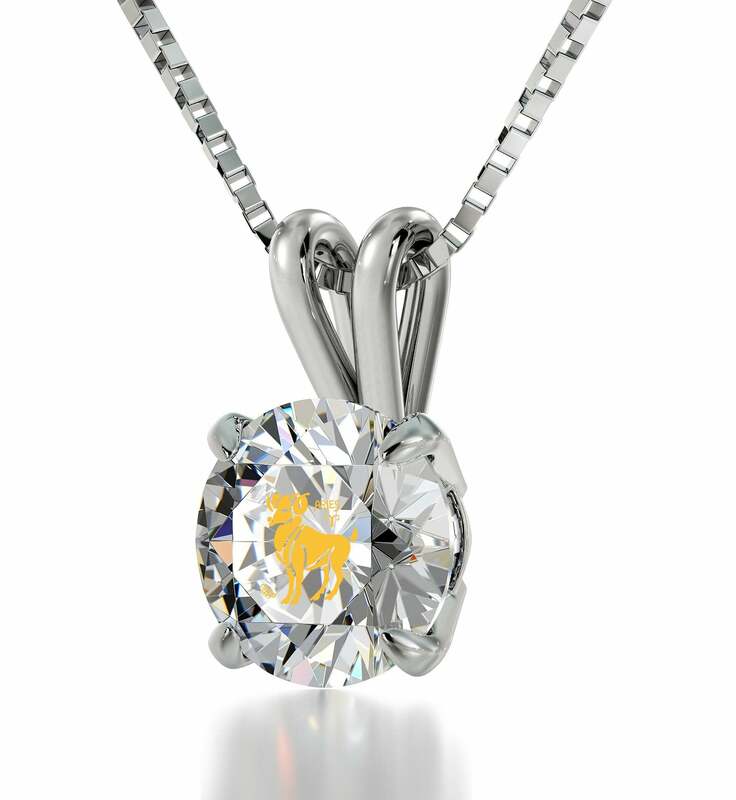 You might have been looking for an appropriate present for girlfriend or wife which represents the gratitude born from having someone like her walk beside you, and by coming here you’re well on your way to discovering the perfect birthday gift idea for her to give that gratitude an extraordinary form. 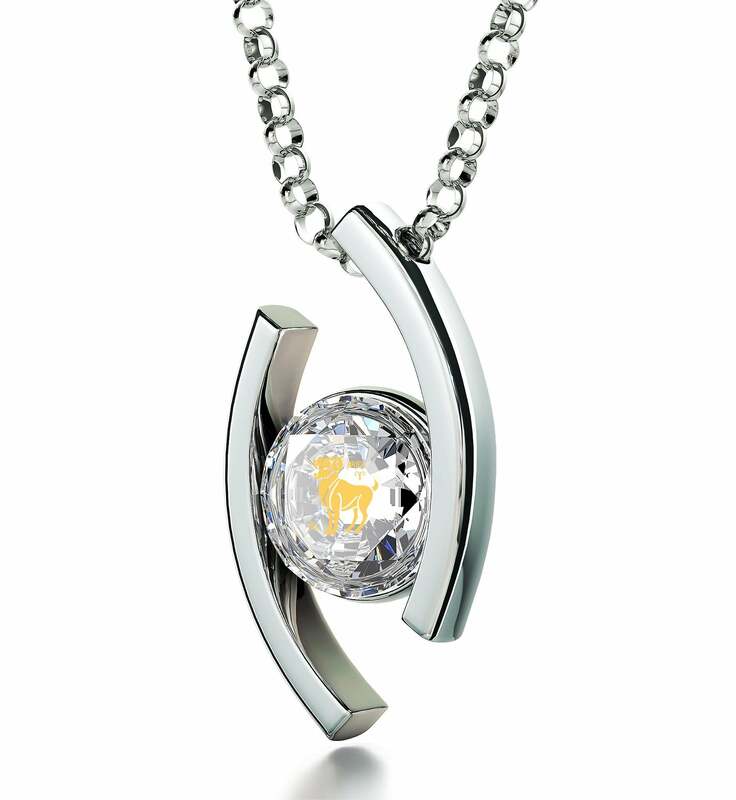 Behold, Nano Jewelry’s wonderful selection of Aries jewelry! It is part of a much larger gathering of zodiac collections featuring Leo zodiac necklaces, Virgo pendants and equally delightful pieces of meaningful jewelry for all the other star signs. In this little corner of our golden universe though, we celebrate all that has to do with Aries’ determined and creative nature with presents for men and women that were inspired by the sign’s indomitable spirit and thirst for something new, something unique. The energetic nature of Aries means she’s constantly rushing somewhere and could use a fun gift for women that will get noticed in spite of this. The neat solitaire frame of this one along with its slim yet sturdy box chain will make that quite possible. The Swarovski gemstone held by them is conspicuously placed so that even if she’s in a hurry people can get a good look at it. The cute inscription of a golden ram they’ll see in passing will be all the explanation anyone will need. Its golden version is another birthday present for wife worth considering. Even she will be stopped dead in her tracks once she gets a load of this next luxurious piece of women’s gold jewelry. A top womens gift in both a personal and an aesthetic sense, it sports one of the designs that generate the most buzz. 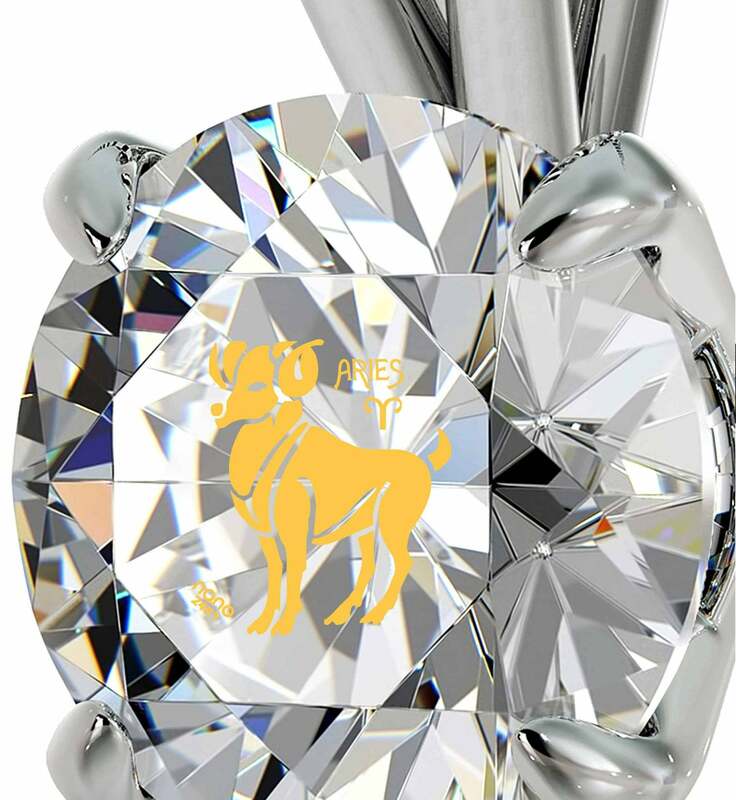 The perfect gift for hopeless romantics, it features a pronounced heart frame harboring Aries’ golden ram as well as no less than eight glittering diamonds that assure her you mean business. Not that many birthday ideas for girlfriend could leave her at a loss for words, but this one undoubtedly will. An Aries would be the last one to object to a promising new idea, so she’ll likely take a particular interest in this cute gift for girlfriend. 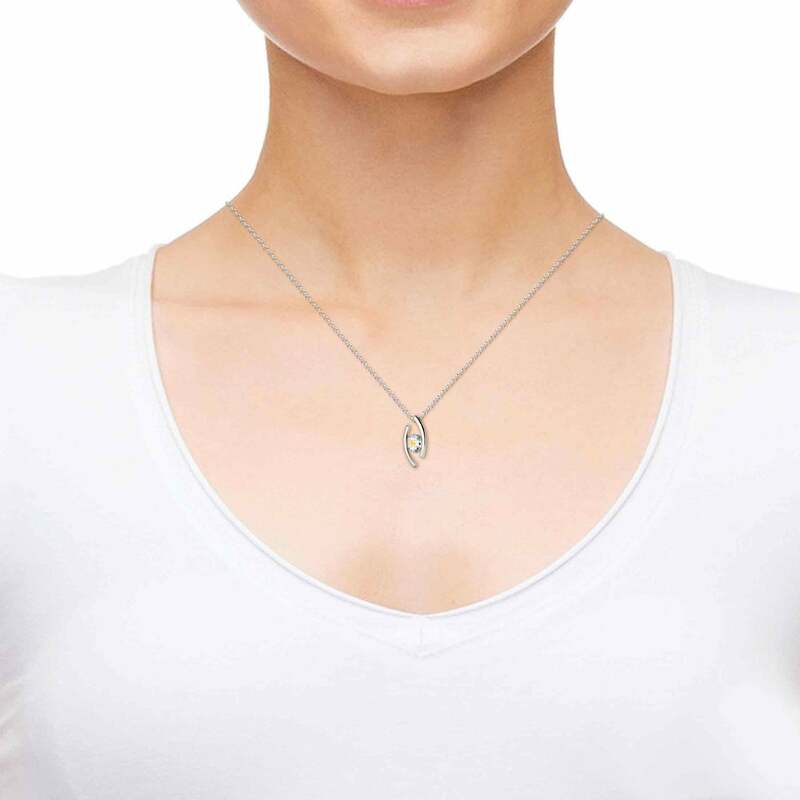 The offbeat 925 silver jewelry with its eye-shaped frame design dangling from a rolo chain of the same material definitely doesn’t resemble most pieces she’s seen before, and for someone who craves novelty this is fantastic news. 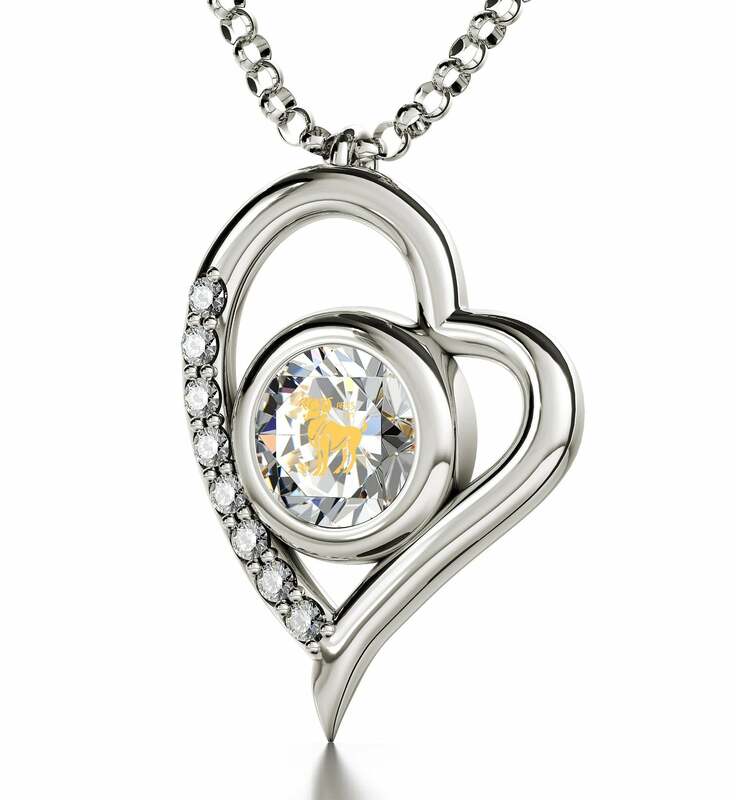 She’ll love to wear it at gatherings with an outfit that puts the womens pendant at the forefront and tell the other guests all about it. Get a step up from silver to radiant gold and you’ll have yourself a unique birthday gift for her that will attract envy as much as attention. For the Aries that enjoys discovering and showing off the finer points of their sign we’ve designed a magnificent Aries necklace of white gold and onyx. 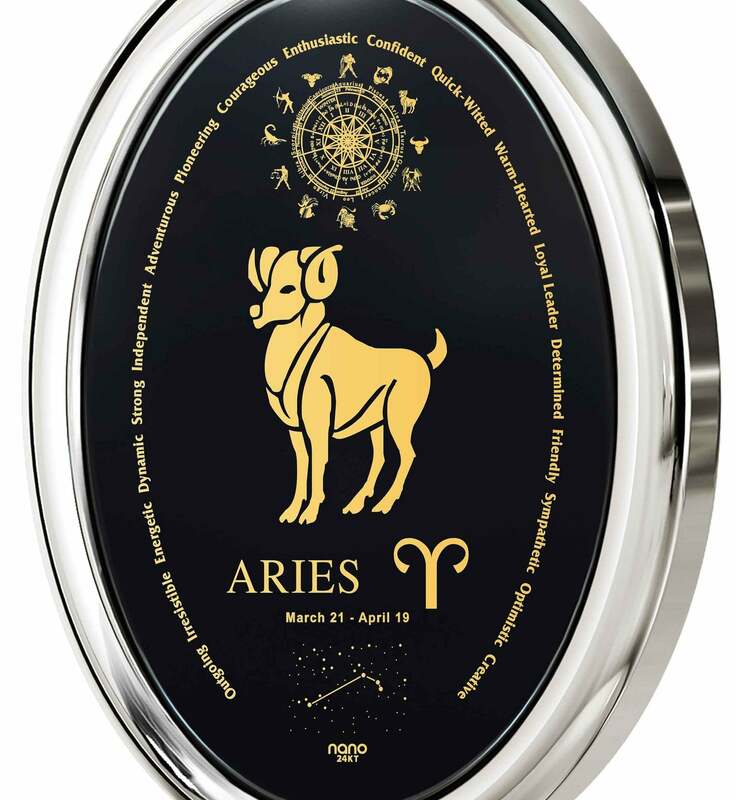 Its inscription of gold contains everything you’d want to know and love about the sign, like the traits of the Aries horoscope personality, an amazingly detailed image of its constellation and more to be discovered with every viewing. It’s a great gift for him or her and a delightful example of our peerless inscription-making techniques at their most intricate. Do any of them look like they’d fit perfectly around the neck of an Aries you respect and love? Remember that you’re never stuck with just one preset and can add more flair to the top gift for wife which you find irresistible if you tinker with its crystal’s color or the precious metals which make up their chains and frames. She wouldn’t want to be limited in her choices, and is likely to appreciate the gift more if she knows that you had to take some initiative and were creative in putting it all together. You’ll be pleased to know that the top gifts for women introduced in this collection will reach their destination in style and in good company. No one should be left out from experiencing the inscriptions’ most delicate contours, and a magnifying glass custom-made to be used with our necklaces is a sophisticated little surprise that will make this a non-issue in a charming way. 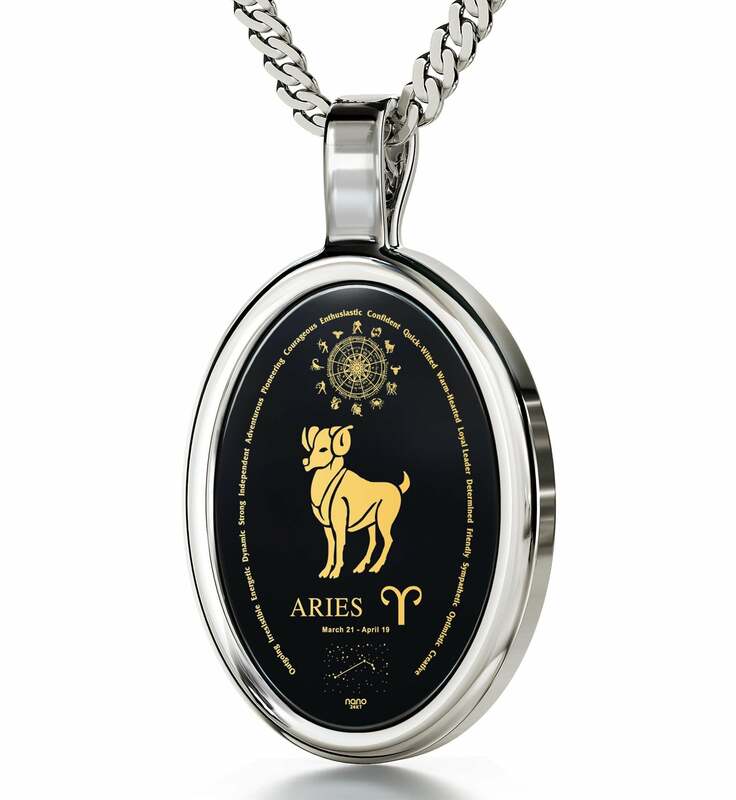 You’ve seen what motivational gifts for Aries our online jewelry shop has become renowned for, and now it’s high time you made someone very happy with one too! Every detail involving shipping and handling has already been taken care of, so there’s really no excuse not to ditch your local brick & mortar stores when shopping around for something truly unusual. Also, don’t forget to check out the other zodiac collections, like the one with Libra necklaces, to get inspired for amazing gifts you’ll be giving in the future.